Marietta Community Foundation has had the privilege of serving Belpre, OH for 45 years! Currently, the Foundation supports the Belpre Area Ministries and Belpre Church of Christ food pantries. We also serve as manager and distributor for the Bom Family Memorial Fund which supports educational activities in the area. We look forward to continuing this service for a long time to come. Marietta, OH – From birth to five years old, children go through important stages of early childhood development. 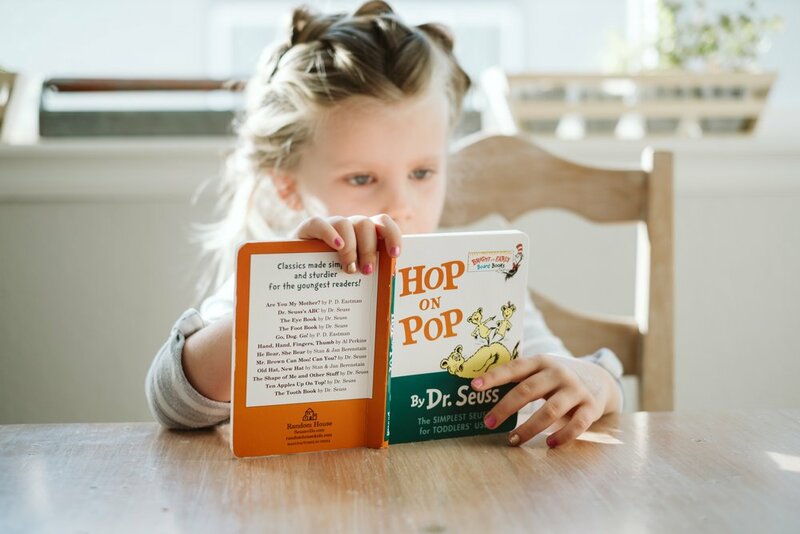 Since 2017, Marietta Community Foundation has partnered with Dolly Parton’s Imagination Library to enhance these stages of development for over 65 local children. With a growing waiting list of potential registrants, the Foundation is reaching out to local donors to sponsor children who could greatly benefit from this service. Children who register through the Foundation receive a free book sent to them from Dolly Parton’s Imagination Library in the mail each month. The book service program began in 1995 but soon expanded to a global entity in the following years. In 2017, with support from The Owen Family Memorial Fund, the Foundation entered into an affiliation with the book service to increase early educational development for local children. Currently, the Foundation is only able to register 52 children. With 19 children on the waiting list, the Foundation is seeking partners to help support any local child interested in receiving these monthly educational tools. Children can be registered from ages birth to five years old with an annual registration fee of 25$. The Foundation is hoping donors would pledge a gift of 125$ to cover all five years of eligibility for each individual child. “Thanks to all that make this program possible. Can’t wait to see what adventure the next book brings to our family,” said the mother of the participants. Inquiries and donations to fund this book giving program, or other programs that directly benefit local children and youth, may be made to the Foundation by contacting Heather Allender at 740-373-3286 or heather@mcfohio.org. Mason Beuhring, Communications & Program Services Director at Marietta Community Foundation, sits down with Marcy Wesel, Secretary of the Board of Directors at the Foundation, to get to know this prominent community member. Mason Beuhring: Hello, Marcy, I appreciate you sitting down with me! If it’s okay with you, I’d like to start by asking where are you from and what is your background? Marcy Wesel: I was actually born in Memphis, TN where my dad was stationed in the Navy. Around 6 months old, my mother and I came back to Marietta while my father continued to serve. I have been here ever since, aside from my time in college. I attended the Ohio State University and graduated with a Bachelor’s in Nursing. I would have continued working at the Children’s Hospital, but I married my husband, David, who is also from this area. So I moved back home, married, and we have two children, Alex and Olivia. MB: What is your favorite thing to do in Washington County? MW: Well, my hobby is “birding.” I like to go birding with my friends because it’s a great way to spend time with them. I enjoy birding in Washington County, but have also traveled to different locations. MB: Are there any specific species that you enjoy finding? MW: Anything that is coming and going… especially the migrant species. On rare occasions we get some unique birds that aren’t typically in this area because some will veer off of their migration path. We have a little network in town and we all find out where that bird is located. Then, everyone can go look at it and get excited just like “bird nerds” do! MB: So do you do any photography to capture these birds you see? MW: You know, I would say the majority of the birding community is into photography. While I appreciate the photography, I have hesitated getting into it myself. It would just be one more thing that would tie me to a computer and I don’t think I can keep up with it. I just like to stand there and watch the bird in its own environment. MB: So how did you become involved with the Foundation? MW: Eric Erb contacted me after I had recently retired from Marietta Memorial. I was very honored to be considered and it has been a very interesting experience. In a way [being on the board] I feel like I’m on the mezzanine looking over all of the many wonderful organizations within Marietta. I get to see how they run, who runs them, and how well they hold together. And, I get to see how they utilize the resources from the Foundation. As I finish out a term here on the board, I feel like I can go to the particular organizations, that I have come to admire, to help volunteer in the future. This is a nice way to figure out where you want to go, but now it’s hard to determine because there are so many that I admire! MB: Is there a specific project you have been involved with, while on the board, that you have been fond of? MW: I particularly like being involved with the Allocations Committee. It has been a lot of fun to discuss each of the organizations and watch some of their leaders grow. We have a huge responsibility in that we have a “chunk” of money and we need to weigh which organizations are allocated funds. Even when an organization is not allocated money one year, it is wonderful to see Heather [Allender] (President & CEO of Marietta Community Foundation), help them for the next time they apply by giving suggestions. I have seen some of these organizations take her suggestions, readjust their plan, and then they are allocated funds for the next year. When it happens, it is really nice to witness. I also like working with scholarships. I enjoy seeing some of these young, future citizens and hearing what they have to say. So many of them are deserving, and the hardest part is not being able to give all of them scholarships. MB: You mentioned earlier that you earned a Bachelor’s degree in Nursing and then you worked at the Children’s Hospital. When you moved back to this area, where did you continue your nursing career? MW: I started at Camden Clark, moved to Marietta Memorial, worked at Washington State Community College as a nursing instructor, and then back to Marietta Memorial. Washington State was my favorite job, and it was the most exhausting. To see the progress of the students was exciting. Now I get to see a lot of them in the community today and see what they have become! MB: As a board member, what objectives do you have for Washington County and its betterment? MW: That is the main word that comes to my mind, “betterment.” It’s always impressive to see the assets this Foundation has. We are entrusted to allocate those assets in a very prudent way for the betterment of the community. I take it very seriously. MB: What is one thing you would like others to know about the Foundation? MW: Well, in your other interviews, you have asked each person if there are any board members they admire, and I thought, “I can’t do that, I can’t pick out one person in particular.” Everyone I have served with is extremely smart in his or her own unique way. The board works well together. Various people have different opinions, but it all comes to a nice collaborative consensus. I never walk away thinking something is unresolved or there’s conflict. It’s always collaborative, everybody comes together regardless of their opinions, through compromise. MB: Marcy, thank you so much for meeting with me! It was a pleasure getting to talk with you. MW: Absolutely, thank you for having me. For years the Marietta Community Foundation has awarded the hard-working and dedicated students from Washington County high schools with scholarships. Because of our donor’s generosity, we are able to help support students in our community as they embark on their higher education journeys. Embrey received numerous soccer awards including league, district, and state honors. As a long time active player in the Marietta Soccer League, Embrey says that it was a “no brainer” to take the opportunity to apply for this scholarship. The Marietta Soccer League Scholarship is a $1,500 scholarship available to one male and one female player each year. Like Embrey, applicants need to be past or current participants in the Marietta Soccer League Program. Although the scholarship requires applicants to receive only one Varsity letter during their high school soccer career, Embrey would be awarded a total of four letters for the Tigers. Not only was Embrey a stand out soccer player, she also had success in the classroom, exceeding the minimum required G.P.A. to qualify for this scholarship. Embrey is now currently a sophomore at Marietta College, where she double majors in Communication Studies and Marketing. 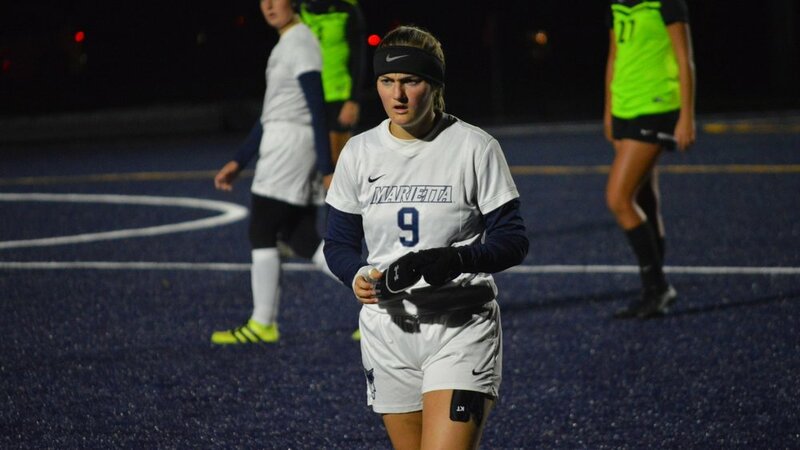 She is a member of the Marietta College Women's Soccer team as well as other organizations such as the Pioneer Activities Council, 5th Street Consulting, and Pioneer Pipeline. Embrey is a two-year varsity soccer letterman and has made huge contributions on the field, both as a defender and in the forward position. According to Forbes.com currently there are more than 44 million borrowers who collectively owe $1.5 trillion in student loan debt in the U.S. alone. Knowing this extreme need The Marietta Community Foundation and its donors are here to support local students by investing in their future. The foundation recognizes that any amount of money will help relieve the financial burden of college. For those who are interested in applying for any Marietta Community Foundation scholarships, including the Marietta Soccer League Scholarship, visit mcfohio.org/scholarships. If you have any questions, please contact the Foundation at 740-373-3286. Several volunteers from Harvest of Hope and Tri-County Food Pantry unload over 700 lbs of donated food. Many may recall, in the wake of the government shutdown, Marietta Community Foundation announced a collaboration with multiple organizations to help bring support to our local food pantries at a time of uncertainty. Through this collaboration, I have had the privilege of helping distribute over 8,ooo pounds of food to 13 different Washington County food pantries. Not only was I able to help with the logistics of this massive distribution, but I was able to help with a few deliveries to several food pantry locations. On my last delivery of this month, I accompanied Harvest of Hope volunteer, Darryl Ting, to the Western Washington Food Pantry. Darryl mentioned it is the willingness for community collaboration that will help Washington County succeed. He said that small towns across the United States are facing the same problems, but the towns who pull through the hardships are the towns which do it together. During the past few weeks I have been able to observe, and participate, in a collaborative effort where many organizations have come together to share resources for the benefit of others. This has given me the opportunity to meet some amazing people who serve our Washington County community in major ways. I have met directors, volunteers, donors, and community partners; all of whom come from assorted backgrounds. 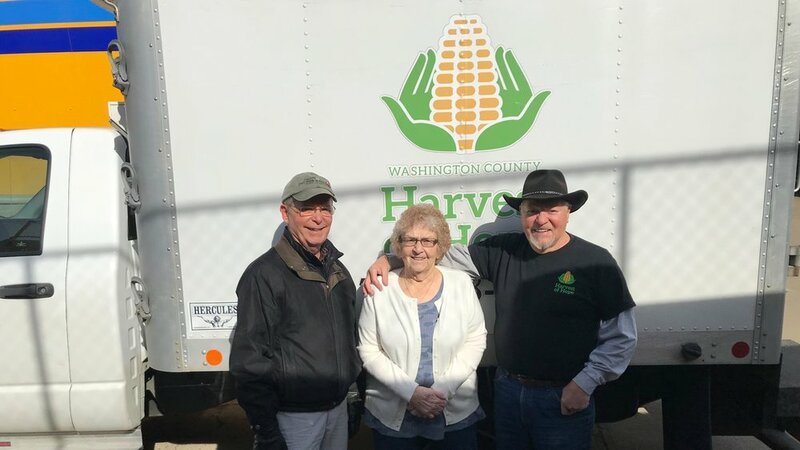 Mason Beuhring (Left), Communications and Program Services Director at Marietta Community Foundation and Mike Buell (Right), Harvest of Hope Volunteer and Marietta Community Foundation Board Member delivered food to Lowell and Beverly Food Pantries on February 11, 2019. Among these individuals, is Ruth Griffin and she serves as the Director of Tri-County Food Pantry. She has served with the food pantry for almost 14 years and by her own admission she is “at the age where she could retire for a second time.” However, I can attest, this has not slowed her down. After unloading the food from the Harvest of Hope truck, I was able to gain a little more insight into Ruth’s efforts in the Lower Salem area. Ruth and her team of 14 volunteers serve meal baskets to roughly 110 people on a weekly basis. 110 people in need of basic food accommodations may seem like a lot, but after a month of interacting with local food pantries, this number did not surprise me. What did surprise me was Ruth’s desire to leverage these meals into an educational opportunity. Ruth and her team pack these food baskets in a very purposeful manner. Not only do they want to put food on the plates of those in need, they want to empower those people to create healthy meals for themselves. Every week, Ruth and her team create a list of four recipes and then stock the meal baskets with the appropriate ingredients. The tenacity and passion Ruth displays serves as an inspiration to never stop creating a legacy in your community. Over 100 people are impacted and empowered every week because of the work she is doing. I am thankful that I was able to meet Ruth, her team, and all of the other volunteers who serve our community well. I would like to give a special thank you to our partners and we look forward to future collaborations. May we continue to serve our county together. Marietta Community Foundation has had the privilege of serving New Matamoras, OH for 45 years! Currently, the Foundation manages and distributes the Frontier High School FFA Scholarship Fund. We look forward to continuing this service for a long time to come. Mason Beuhring, Communications & Program Services Director at Marietta Community Foundation, sits down with Eric Erb, Senior Vice President at Peoples Bank and Vice Chairman of the Board of Directors for Marietta Community Foundation, to get to know this prominent community figure. Mason Beuhring: Eric, thank you for sitting down with me to chat. Let’s start with where are you from and what is your background? Eric Erb: Well I was born and raised in Marietta, but went to college at Mercer University in Macon, GA. My undergrad was in Business Management and I went down there on a golf scholarship. I tried to get as far south as I could get. And, like most youth, when I left I did not intend on coming back. But then, through maturity, I realized the value of a small town and the benefits of a close-knit community. So when I had an opportunity to come back, I took it. MB: What are some of your hobbies and interests? EE: I’m very involved in church, I still play a little bit of golf, try to play basketball a couple times a week, and I’m very involved in my family. My wife, Lynn, and I have two amazing daughters. Our oldest daughter, Elissa, is a sophomore at Taylor University, and our youngest, Isabelle, is a senior at Williamstown. MB: You mentioned a few different sports as hobbies, do you have any favorite sports teams? EE: I love the Ohio State Buckeyes. Outside of that I don’t really have a favorite [pro-sport] team, but I won’t miss a Buckeye game on T.V. MB: Okay, I’m going to shift the conversation a bit and ask why did you choose Financial Advising for your career? EE: My wife and I met with a financial planner. I had always had an interest in financial planning, an interest in investment analysis and management. From that initial meeting with that planner, it developed in to me joining his practice. I later moved my practice to Peoples Bank in 2006. MB: How did you end up getting involved with Marietta Community Foundation? EE: I was invited to join the Board [of Directors] about 12 years ago. I always had tremendous respect for the Foundation, always looked at how the Foundation was ran, and always respected the quality of the Board of Directors. For me I was kind of shocked and surprised that I was invited. I was really honored by the opportunity to join that group. Marietta Community Foundation’s Board of Directors serve two consecutive five-year terms. After completing two full terms, and then taking a year off, Eric Erb has just started his third five-year term. MB: So after completing two terms [total of 10 years] as a board member, what prompted you to take up this mantle again and serve as the Vice Chairman of the Board? EE: I love what the Foundation does… I love to see people having charitable intent. I love to see people trying to assist other organizations and people in need… It’s neat to see people give. It’s fun to be a part of the Foundation and assist money going to where it is most needed. It is wonderful to see donors get engaged with the Foundation with ideas that they have. I enjoy seeing us [the Foundation and its Board of Directors] do the best we can with our unrestricted funds, but I also like seeing the restricted funds from donors. Giving them our thoughts and ideas on where to give and how to give. I have enjoyed seeing Heather [Allender, President & CEO of the Foundation] develop into a strong professional. I have gotten to see her work from a part time employee all the way to where she is running the place. So, seeing her professional development has been something special. Also, the Board has had such quality people. They have helped me grow in my role on the Board and as a person. They are talented, smart, and interesting people to engage with. The Board meetings aren’t one of those meetings where you say, “Oh, darn I have to go to this meeting.” I look forward to them because they are engaging and challenging. MB: Are there any particular board members who have greatly influenced you over the years? EE: For me many of them stand out, but I think the one who stands out the most would be Karen Osborne. MB: That seems to be a general consensus from everyone I have talked to so far. EE: She’s a genius! I had the opportunity to interact with her while she was still in accounting and she helped myself and my clients tremendously. She also has a great style and demeanor about herself. She can get her opinion across without causing friction and people turn to her if there are tough decisions to be made. Her intellectual and historical knowledge of the Foundation is invaluable. MB: What is one thing one you would like people to know about the Foundation? EE: I wouldn't say it would just be one, but three things. First, they should have confidence in how the Foundation is run. We bench-mark ourselves against other foundations our size. They are getting a well-oiled machine, it is very efficient with no waste. We try to get every penny we can out of expenses to give it back in the community. Also, the fact that there are no fees is unusual for organizations like ours. Second, would be our unrestricted giving. Let us do the due diligence for the donor. Let us do the due diligence on what organizations are most in need and most worthy. And, lastly, if restricted [funds] is where you want to go, use the capabilities of the Foundation. Make a lump sum deposit and then let us cut the checks based on your wishes throughout the year. It saves on your checks and it saves on your accounting nightmares. MB: Thank you for your time, Eric. Each month we will be highlighting a different city or town in Washington County that we have had long-standing partnerships with. This month Marietta Community Foundation would like to thank Beverly, OH for allowing us to partner with them! Marietta Community Foundation has had the privelege of serving Beverly, OH for 45 years! Some of our major gifts include funding for the Beverly-Waterford Community Swimming Pool, renovations at Dodge Park, and quarterly support for Beverly-Waterford Food Pantry. We look forward to continuing this service for a long time to come. Mason Beuhring, Communications and Program Services Director at Marietta Community Foundation, sits down with Bret Frye, owner of Frye Dental Group and newly appointed Chairman of the Board of Directors for Marietta Community Foundation, to get to know this prominent community figure. Bret Frye: I graduated at Warren High School, I’m a local kid. I was born in Columbus, but I’ve basically lived my entire life here [Washington County]. I went to college at Kenyon College and got a B.A. in Chemistry. From there I went to The Ohio State University College of Dentistry. MB: Were there any prominent figures that impacted you early in your career? BF: My work ethic is a result of the example of great effort and attention to detail that I saw from my parents, as I was growing up. Out of my grad program, I started practicing with a guy named Doug McIntyre and he gave me a great start in my practice. I eventually started my own practice in 2001 and then I practiced with my brother for about 10 years, which was probably the highlight of my career. I now practice with Alaina Perry and she is very special… very talented and very smart. MB: One of our primary messages at the Foundation is the ‘importance of leaving a legacy.’ Have you tried to model what Doug McIntyre did for you in your practice with any up-and-coming doctors in your field? BF: When I started out, I was the ‘young guy’ in town and I got a great start from an older guy, as I mentioned before. Now I’m on the other end, I’m the ‘older guy’… I’ve had the advantage of getting John started and Alaina is with us now. So as a practice it has been very successful. MB: So how long have you served with the Foundation’s Board of Directors? And, what has your experience been like? BF: I’ve had a unique opportunity with the Foundation. I’ve been on the board for eight years, mostly with the Allocations Committee. Working with so many amazing and dedicated people has been a great experience. MB: Are there any board members you have come to admire during your time on the board? BF: Absolutely! Every time we [the board] get done with a meeting and Karen Osborne is there, I have learned something new. Karen actually looks through everything and grinds the numbers. She is just a great board member… I always use her as my example. She is my litmus test when it comes to board members. MB: Are there any other past or current members of the board that have made an impact in your life? BF: [When I first came on the board] I got to start with really good members like Mark Schwendeman. Just a really sharp guy, he is one of those guys who has 26 hour days… he gets so much done! I am grossly inefficient when compared to somebody like that. Eric Erb, has a great knowledge of investments and has great people skills… the guy might know everybody, really. Chip Riggs, he has a legal mind that is thoughtful. You know he doesn’t talk a lot, but it’s because he is listening. Then when he says something, it's relevant because he doesn’t talk just to hear himself talk. Teri Ann, she is a talented person that brought a very caring, Christian perspective to our decisions. She is also very business-minded and practical. Kin Brewer, he is a good example of a leader that “just asks better questions”. He drills down on information like a bulldog. Of course my predecessor as Chair of the board: Jennifer Christy. She is just a great example of someone who wants to engage and change this community for the better. Honestly, there are just so many I could mention, but those are the few that come to mind. There has not been one board member that I have worked with, so far, where I think, “What do they add?” None of these people just "fill a seat." MB: It’s great to hear that our board is very active. What are your thoughts about the other major component of the Foundation, the staff? BF: This all filters up to Heather [Allender]. Heather has been the best thing that has happened to this Foundation. In terms of leadership, she has usually thought about every possibility about a decision before we even ask her. She's incredibly intelligent and has unique people skills. She does a great job of being strong and firm without being off-putting. In this position you can’t be a ‘bull in a China shop’ so to speak… you can’t be like me… She does a fantastic job for the Foundation and our community. Britani [Merritt] does a great job of making sure everything is running smoothly and orderly, she is a hard worker. And, I'm excited by you being hired. I look forward to seeing how your talents benefit the Foundation and our community. For our community to continue to grow and thrive, we need young and talented people. I think the staff at the Foundation fit that mold. MB: I appreciate you saying that, thank you. As I mentioned before, one of our main messages here is “leaving a legacy.” And from what I understand, this isn’t just a message you help promote, but something you have acted upon. Would you mind sharing a little bit about the funds you have established with the Foundation? BF: We [my family] have a fund here, The Leslie Frye Foundation - Living with Cancer, in memory of my first wife who passed away due to complications with breast cancer. When she passed away we set up this foundation to send women, who have cancer, and their families on vacation. No expenses, we take care of everything. It is important to create good memories for the family in such a difficult time. When someone goes through cancer, they are going to take a beating. Through chemotherapy, radiation, surgery, picclines, you name it, you are going to have some really tough days. So it is important to have something on your calendar that you can look forward to. MB: Outside of your practice and serving with the Foundation, what other activities are you involved with? BF: Well my kids go to St. Mary’s Catholic School and Williamstown. Two of my kids go to St. Mary’s so I coach the [boys] basketball team and I coach my son’s soccer team and my daughter’s soccer team. I’m real fortunate, we have five kids which make up our blended family. I really enjoy spending time with my wife, Melissa, our 5 children, and our new puppy, Gracie. MB: We will start to bring this to a close, I appreciate you being open to talk with me. One last question: What is your favorite thing to do in Washington Co.? BF: I love to go to ballgames and go hiking out at Broughton’s. I enjoy spending time with friends and their families-we are really lucky to have this community. It's not perfect, but when friends from out of town come to visit, they are amazed at the closeness and friendliness we have here in Washington Co. It is still a great place to raise a family. MB: Bret, I appreciate your time. BF: Thank you, it was a pleasure. Marietta, OH – The Marietta Community Foundation has received its largest donation in its 45 year history. Approximately 5.5 million dollars has been bequeathed to the foundation from the estate of Adriann “Arie” Janssens. Through his donation, Janssens desired to impact the lives of young students and the communities in which they reside. Before his passing on May 20, 2018, Janssens took the necessary steps to ensure these desires would become a reality. Through his partnership with Marietta Community Foundation, Janssens created two funds: The Carol Christy Scholarship and the R. Neil and Doris Christy Community Fund. The Carol Christy Scholarship was created in honor of Janssens’s late wife, Carol Christy. This scholarship will be available to graduating seniors attending a Washington County High School who plan to obtain an undergraduate degree from a four-year institution. For eligible students, the Christy Scholarship can help offset up to 50 percent of overall tuition and fee costs for up to four years. Janssens established the R. Neil and Doris Christy Community Fund in honor of Carol’s parents. This fund is an Unrestricted Fund and will be used to meet the needs of the community of Washington County. Restricted Funds, such as the Christy Scholarship, are funds dedicated for a specific group or purpose established by the donor. Unrestricted Funds, such as the Christy Community Fund, are donations given to an organization to be used at its discretion as needs or emergencies arise in the community. Both Janssens and Christy valued educational advancement and hard work. Janssens, a native of the Netherlands, immigrated to the United States as a young adult. To pay for his own education, he worked multiple jobs while attending Kent State, where he would eventually complete a Bachelors degree in Geology. Janssens would then go on to complete Masters and PhD degrees in Earth Science at Ohio State University. He later became an expert in the subsurface geology of Ohio and created his own consulting business. Christy, a graduate from Marietta High School, spent 30 years teaching Political Science at Ohio University - Lancaster. She became a leading authority in women’s participation in politics. As the end of the year draws near, now is a great time for giving. When you make a donation to the Marietta Community Foundation, you aren’t just giving money—you are making a meaningful difference in your community. 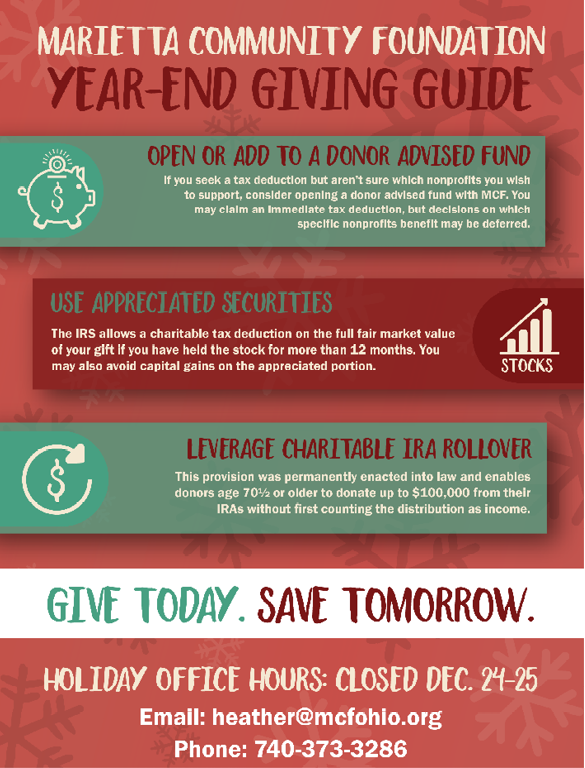 Here are ten ways to make the most of year-end giving! Before making a significant charitable gift, consult with your CPA, attorney or advisor to fully understand the impact on your taxes and estate. Take time to review and understand your tax liability for the year. Pay attention to unearned income and assets - were there significant changes? The answers may determine how much you want to give at the end of the year. Talk with your employer to see if they offer a gift matching program that can increase the impact of your gift. If you would like to make a year-end charitable gift, consider giving appreciated stock. Selling stock will incur capital gains on the appreciation, but if you give stock as a charitable gift, you will receive a deduction for the current market value of the stock—just as you would with a cash gift. A gift by check is complete when mailed or postmarked to the charitable recipient, even if not cashed until the following year. Online gifts or gifts by credit card are considered complete when your credit card account is charged. Gifts of stock or real estate are more complex, you should not wait until late December to make these gifts as it may be too late to make the necessary arrangements. While there are many worthy organizations and causes, only donations to qualified 501(c)3 organizations are tax-deductible. If you decide to give through the Marietta Community Foundation, we will document the status of all nonprofits prior to making a gift on your behalf and our team can help you identify organizations that are qualified to receive your gift. 7. Do you have more than enough? If you are receiving taxable income from retirement plan assets or life insurance policies, there are a number of tax-advantaged ways to make these assets work for you and the charitable organizations you support. For example, the Charitable IRA Rollover Act allows donors age 70 ½ or older to donate as much as $100,000 from their IRA without counting the distribution as income. The Marietta Community Foundation can assist you in creating a giving plan and help you think strategically about how and to whom you give. Our staff will help to ensure that your donations make the greatest impact on the causes you care about, while maximizing tax advantages. Working with the Marietta Community Foundation gives you access to our staff's extensive knowledge of the local nonprofit community and the broad charitable needs of the Mid-Ohio Valley. We help you stay informed about the organizations you support and the effect your giving will have on the future of your community. The state and local tax deduction is now limited to $10,000 and the deduction for miscellaneous itemized deductions has been suspended. It may be beneficial to "bunch" multiple years of donations into one year and limit donations in the following year. This will enable you to itemize deductions in alternating years. The staff of the Marietta Community Foundation is on the front lines of serving the community of Washington County. However, behind the scenes is the Foundation’s Board of Directors, a group of prominent community leaders who help guide, oversee, and ensure the Foundation operates at its highest capacity. As the New Year is on the horizon, the Foundation and its board members are preparing strategies to grow their abilities to promote positive impact in Washington County. Part of these preparations include bidding the exiting board members a fond farewell, and welcoming new additions. The exiting board members include Arlene Archer, who has served ten years, Doug Robinson, who has served nine years, and Dee Wetz, who has served four years. In their honor, the Foundation has sponsored six children, two per exiting member, for the Salvation Army’s Angel Tree Program. The ATP provides gifts of new clothing and toys to thousands of children who otherwise might not have anything for Christmas. The Foundation’s honorary gift will go to children in the local Washington County community. As a last act of charitable giving, the exiting members joined their remaining peers on the board and voted to grant $2,000 to Caring Connection, a local non-profit that assists families with utility payments through the holiday and winter season. Although the Foundation is losing three key board members, they are proud to welcome three new prominent community figures to their ranks: Carol Schneeberger, Peoples Bank; Michael Buell, Retired, Buell & Sipe; and Ryan Elliott, Northwestern Mutual. “We at the Foundation are incredibly excited about what this New Year is going to bring. We have expanded our staff and plan to increase our presence in the community significantly,” said Allender. The Marietta Community Foundation meets National Standards for operational quality, donor service and accountability in the community foundation sector. Founded in 1974, the Marietta Community Foundation has grown over the years thanks to a number of generous individuals. Donations to assist in funding grant applications, or other local needs, may be made to the Foundation by contacting Heather Allender at 740-373-3286 or heather@mcfohio.org. Marietta Community Foundation Welcomes Mason Beuhring to Our Team! In the past several years the Marietta Community Foundation has been able to achieve a growth unprecedented in our 45 year history. Because of our community’s generosity, we have been able to meet the needs of our community more efficiently and at higher rates. With this accomplishment and for this pattern to continue, The Foundation and its Board of Directors recognized the need to expand its staff. We are proud and excited to welcome Mason Beuhring as our new Communications and Program Services Director. Mason was born and raised in Huntington, WV. In December, 2014 he graduated from Marshall University with a Bachelors of Arts in Public Relations and a Minor in Marketing. He is continuing his education through Liberty University online, where he has started a Masters of Arts in Visual Communication. While attending Marshall University in his undergrad, Mason, met his wife, Bethany, during his Sophomore year, her Freshman. The two would later get married while finishing up their undergrad degrees. Bethany would go on to continue her educational career by completing a Masters in Athletic Training. In 2017, the couple welcomed their identical twin boys into the world: Gideon Beuhring and Judah Beuhring. Though the birth of their sons caught them off guard, the couple was thrilled… scared, but thrilled. With such a dramatic shift in their lives, the couple began to make plans, seek counsel, and rethink everything. Before moving to the area, Mason served at a church formerly called Marshall Community Fellowship as a Collegiate Ministry Intern. There he built strong relationships in the community and established a mentorship network with a local inner-city elementary school. “Partnering with that Elementary school was an amazing experience, and I am proud to say years later it still continues! That experience taught me the true value of community engagement. I am excited to bring that energy and knowledge to this new position at the foundation. Plus, I thought it was a bit providential that Marietta Community Foundation had the same initials as Marshall Community Fellowship,” laughed Mason. Mason’s background includes a strong skillset in Graphic Design, Marketing, Verbal and Written Communication, Sales, and Relationship Building. Previously, he has worked Outside Sales and Marketing for The Workingman’s Store, Admissions Manager and Associate Director of Marketing at Ohio Valley University, and has freelanced for various institutions including Stonewall Group Retail Marketing. He currently assists with the youth group, organizes the Small Group Bible Study Ministry, and serves as a Deacon at Vienna Baptist Church. Mason claims that although he is a West Virginia boy at heart, he can’t wait to serve the Washington county area with the same vigor as he would his home state. At the Marietta Community Foundation, we want to make sure our donors are getting the most out of their community investments. That is why we created our "Year-End Giving Guide" to help educate our past, present, and future donors! If you seek a tax deduction but aren’t sure which nonprofits you wish to support, consider opening a donor advised fund with MCF. You may claim an immediate tax deduction, but decisions on which specific nonprofits benefit may be deferred. The IRS allows a charitable tax deduction on the full fair market value of your gift if you have held the stock for more than 12 months. You may also avoid capital gains on the appreciated portion. This provision was permanently enacted into law and enables donors age 70½ or older to donate up to $100,000 from their IRAs without first counting the distribution as income. The Foundation will be closed December 24th and 25th. Building Bridges to Careers, this summer, announced a new professional development series for local teachers to expand their network of support by tapping into other community networks. “The class is designed to expose teachers to innovative technology used in various employment sectors by teaching them to use the technology available in the Epicenter Makerspace and connecting it to the curriculum they teach,” said Tasha Werry, Building Bridges to Career Director. Tasha hopes this connection will encourage teachers to connect their students to the technology through a field trip to the Epicenter. Participating teachers will have an opportunity to apply for a mini-grant supported by the Marietta Community Foundation to help cover transportation and/or material costs, as needed, which will aid their efforts to provide innovative projects and programs for their students in the future. One such teacher, at Frontier Local Schools, received one of the mini-grants to send her 7th grade students to the Epicenter. "The Building Bridges to Careers program has created so many wonderful projects for our students and families, but our remote location inhibits opportunities and exposure for our students." commented Kristi Leonard, Junior High School Math teacher with Frontier Schools. "Par Mar Stores, a local family and the Marietta Community Foundation have made it possible for Frontier to bus our students to the epicenter. For that we are grateful!" “By connecting the teachers directly to the Foundation, they will be exposed to philanthropic efforts that support education and learn to tap into this resource for the benefit of their students,” Werry added. The Foundation encourages teachers throughout all of Washington County School districts to apply for the mini-grant program for field trips to the Epicenter, as well as, for other projects within the schools. Locally owned businesses undeniably play a major role in the vitality of the communities in which they are situated. From sustaining the local economy, to providing jobs to area residents, and supporting the community’s overall well-being, locally owned businesses truly appreciate and value their neighbors. For the past four years, Superior Toyota located on Seventh Street in Parkersburg, WV, has served as the lead sponsor for MCF’s “Grant Your Grant” nonprofit challenge, helping to leverage more than $61,000 in grant awards to Washington County nonprofits. The challenge, held during National Community Foundation Week (November 12th through the 18th annually), offers nonprofit organizations in Washington County, Ohio, the opportunity to win grant awards to further provide their services and meet the needs of the community. While many community members may be familiar with our local non-profits, the challenge provides an added opportunity for them to obtain a newfound understanding of all that they do. Each of the participants agree that the “Grant Your Grant” Challenge is a very exciting and innovative way to engage the community and raise awareness about many of the active and deserving non-profits within the area. Just this past week, Superior Toyota announced their support for the “Grant Your Grant” challenge again for next year. Marietta Community Foundation hosted its 4th Annual Event yesterday evening, welcoming many donors and supporters across Marietta, Washington County and the Mid-Ohio Valley. "Our partnerships are everything," commented Heather Allender, President & CEO, "Through our partnerships, we speak with one voice. We are heard." For the second year in a row, the Foundation recognized three individuals, businesses and organizations for their outstanding contributions. Ron and Louise Holmes receive the 2018 Outstanding Philanthropist of the Year for an individual or family. Louise is a past board member of the Foundation who has also assisted numerous local nonprofits and been involved in so many ways in the area. She is known for her creative thinking and willingness to help her community. Additionally, the Holmes family has supported the Building Bridges to Career Epicenter and hold a variety of charitable funds with the Foundation. Solvay Specialty Polymers received the 2018 Philanthropist of the Year for a business, recognizing their philanthropic impact on our community. Since Solvay has joined their philanthropic efforts with the Foundation in October, 2016, we have helped them process more than 185 grants that have benefitted the entire Mid-Ohio Valley. They are certainly a business that we can always count on for their generosity to our local nonprofits and individuals in need. Tasha Werry, Executive Director of Building Bridges to Careers, was present to accept the 2018 Innovation in Grantmaking Award for her work in establishing the Epicenter Makerspace. Even before opening the doors to the Epicenter in March, the Building Bridges to Careers program has done a great deal to further workforce development in our area. The Epicenter has welcomed; 8 small businesses in the incubator, provided coaching services to 24 businesses, and created 20 jobs for local businesses. Not only does the Epicenter provide services and training for new or growing businesses, they also offer classes throughout each month on painting, laser cutting, 3D printing and so much more. In fact, the vases for the centerpieces at the event, were created using 3D printers. In addition to their outstanding efforts, our awardees this year all highlight the importance of collaboration. 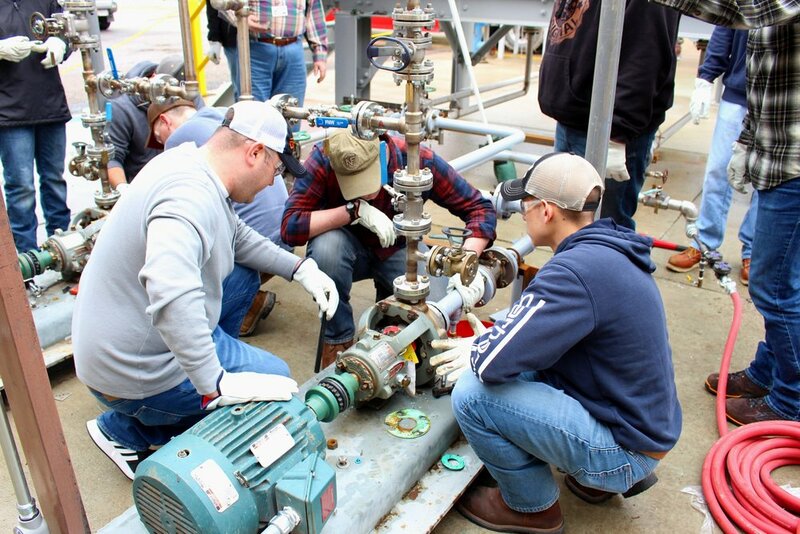 Partnerships like these help us pool resources, make more connections to address the greatest community needs, and bring the whole community together.